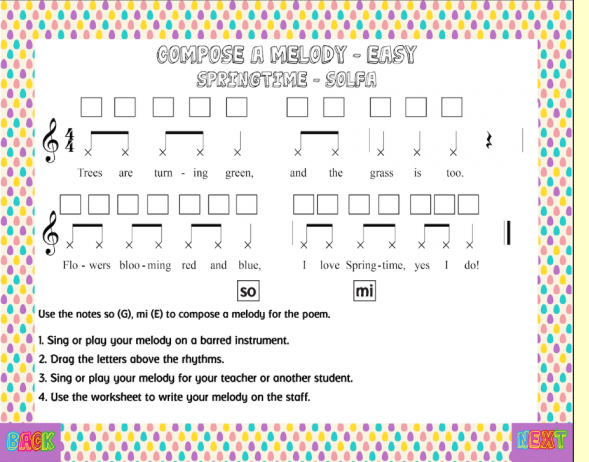 – there is a class Big Book template available for this song in the Printables section at Musicplayonline.com. Musicplay 2 – #83 Mom, You’re the Best . 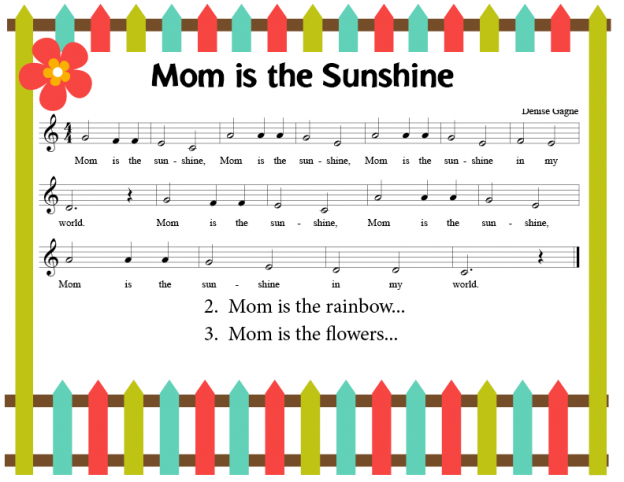 – there is a class Big Book template available for this song in the Printables section at Musicplayonline.com. 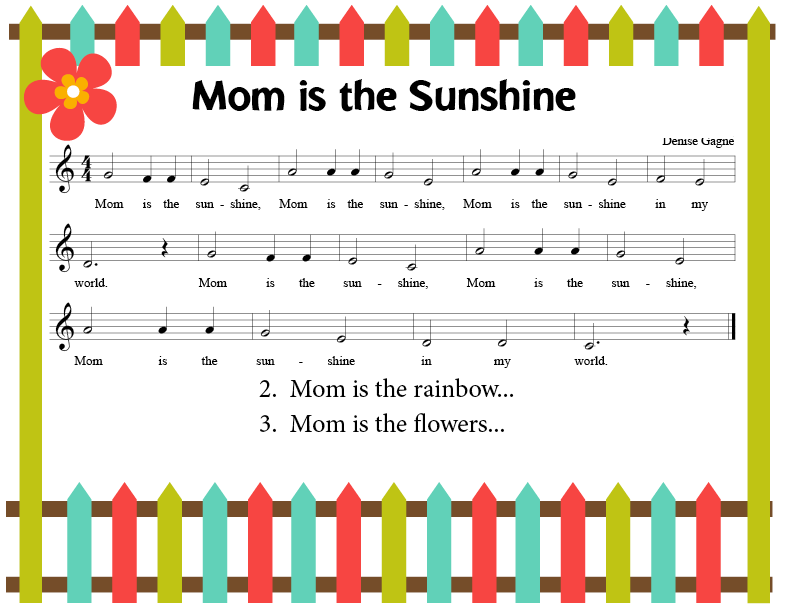 There is a new song for PreK, Mom is the Sunshine, that is written, but not yet recorded. 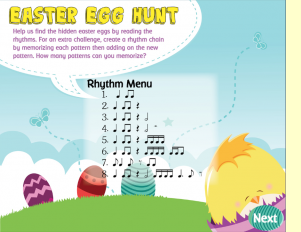 This will become song #121 in PreK atMusicplayonline.com. I wrote it last Thursday, and our wonderful arranger got me an accompaniment track in time to teach it to my PreK class the same day. The kids and I added movements, and they can sing and do the movements (will have kids demo soon too!). 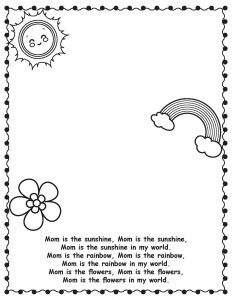 My PreK class seemed to get that “Mom is the sunshine in my world” is a metaphor (without using that vocabulary), and I invited them to create new verses. One thought of, “Mom is the Butterflies.” and that was lovely. Then a hand went up, and this child suggested “Chicken.” Chicken? 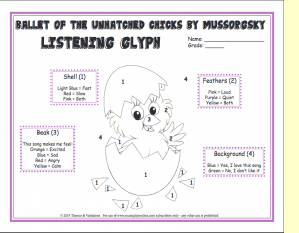 I asked her if she really liked chickens a lot and she said she did, so we sang, “Mom is the chicken.” We won’t record that verse, but you can sing it with your PreK – Grade 2 students if you like! This is the printable for the new song. We thought that teachers might want to have the children color and illustrate what they think the song is about. 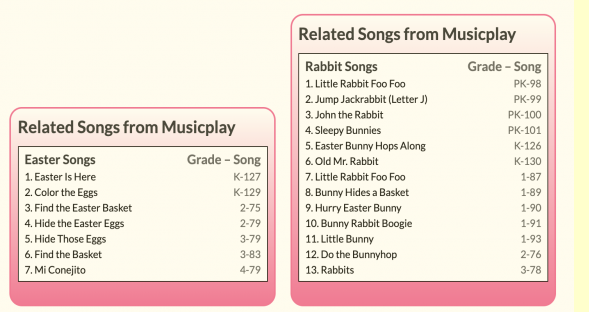 In PreK, this is responding and connecting in the USA national standards: a With substantial guidance, talk about personal and expressive preferences in music. MU:Cr3.2.PKa With substantial guidance, share revised musical ideas with peers. 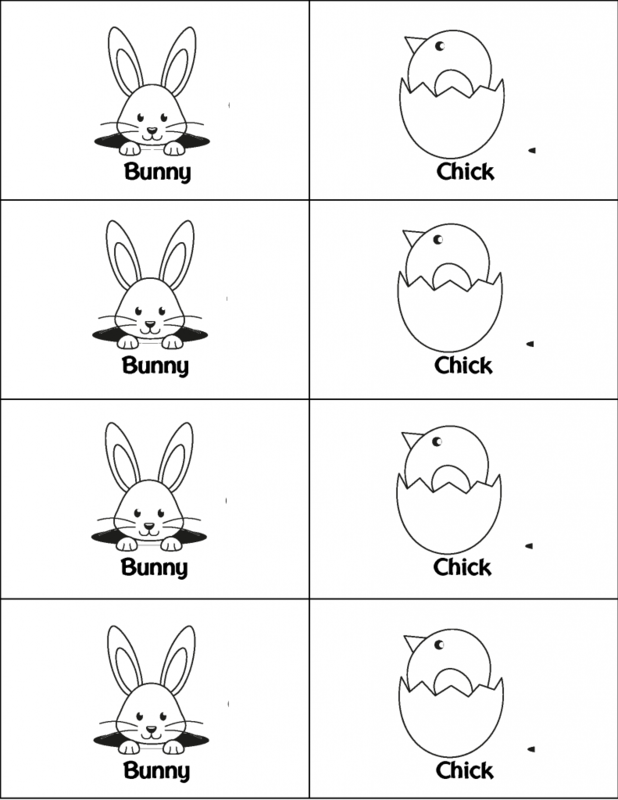 (chickens or butterflies?). MU:Pr4.2.PKa With substantial guidance, explore and demonstrate awareness of musical contrasts. – should we sing it quiet or loud? Why? 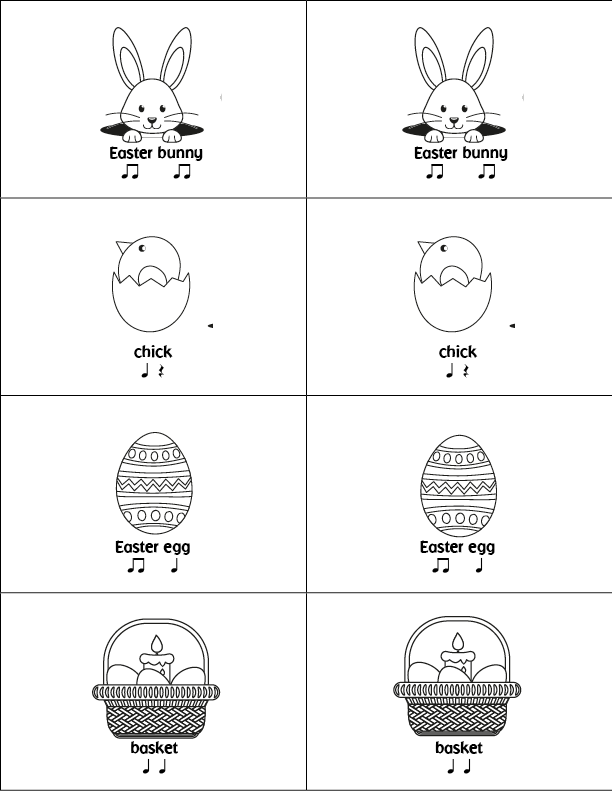 For your older students, we’ve created a poem/body percussion activity in the UNITS section in Mother’s Day at Musicplayonline.com. 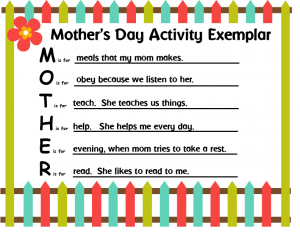 Objective: The students will create an accompaniment for a Mother’s Day Poem. 1. Project a copy of the activity, and discuss possible ways to fill in the blanks. If you like, you could create a class composition, or could have students do it individually. 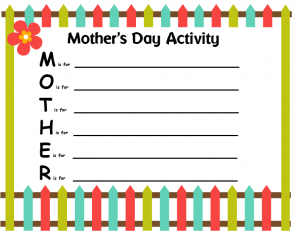 If doing this individually, give each student a copy of the Mother’s Day Activity printable. If you have very little time, you could use the exemplar that is given for the activity. Say each line of the poem in rhythm. For example: M is for meals that my mom makes. 4. Discuss the performance and decide if you like it. Try it a new way and decide if you like it better. 5. If you wish, and if time permits, transfer the body percussion to unpitched instruments. 6. Discuss the performance and decide if you like it. Try it a new way and decide if you like it better. The lesson plan that’s posted online, includes alignments to the USA national standards for Gr. 3 – Creating. To all the teachers who are mothers or care-givers, you are busy, busy people and I hope your families celebrate you on Mother’s Day and Father’s Day. Want a great PD workshop this summer? Come to the Artie and Denise Summer Symposium #9 in Herndon, VA (near Dulles and Washington DC). It’s an awesome workshop with teachers from many states, provinces and countries attending! This entry was posted in Mother's Day, Spring and tagged Denise Gagne Mother's Day, Mother's Day music, Mother's Day music lesson, Mother's Day song on April 27, 2018 by Denise Gagne. 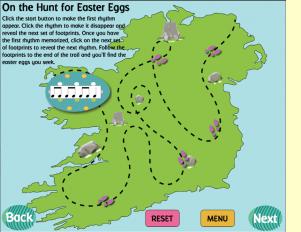 A fun lesson for the week before Easter, would be to teach your classes, Find the Easter Basket. This has always been a favorite lesson for me to teach before Easter. It’s a great opportunity to review dynamics, including crescendo and decrescendo or diminuendo. If teaching to Gr. 1-5, read the rhythms for the song by projecting the digital resource or musicplayonline.com, read from the student books, or write them on the board. 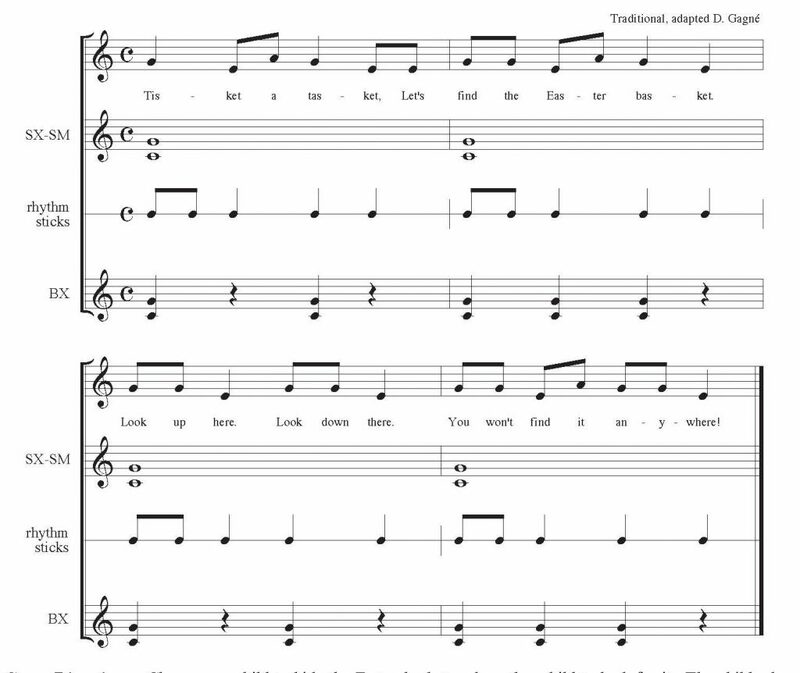 Teach the melody by rote, or if your students can read la so mi, have them read the melody. Explain how the game is played. Don’t let the students shout. If the sound is harsh, have them clap the rhythm of the song softly and getting louder to show where the basket is, instead of singing. Game Directions: Choose one child to hide the Easter basket and another child to look for it. The child who is going to hunt for the basket leaves the room while the “hider” hides it. When the finder returns, the class sings the song, singing softly when he/she is far away from the basket, and singing louder as he gets closer to the basket. The basket must be hidden in plain sight. The game continues until everyone in the class has had a turn to hide the basket or to find it. If you have a really large class, and kids are getting wiggly waiting for their turn, play the game over two classes. Keep track on your class list of all the students that have had a turn to hide or find the basket. In my classes, the kids get to hide OR find — not both. Older classes still like playing games! For an older class, show them how a simple game song like Tisket a Tasket can be turned into a jazz classic. Search on YouTube for Ella Fitzgerald’s version of the song. Discuss how the Ella Fitzgerald version differs from the game song given here. Make a Venn Diagram that shows how the versions are similar and how they are different. 1. Teach the Orff arrangement, starting with the bass part and adding as many parts as your students can handle. 3. Have them play the patterns on body percussion or non-pitched instruments. Or, improvise melodies based on the rhythm of the patterns on barred instruments. Use the patterns as an introduction to the song, or as an interlude between repetitions of the song. For the little ones, make a pattern with one and two sound cards. 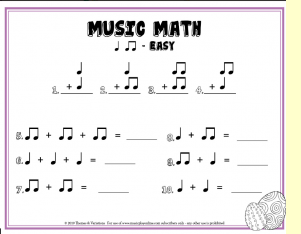 With your older students, give them cards with two beat rhythms. I use white CD envelopes to store my cards – then I can easily see with set of cards I have in them. A tip from Christie Noble and Tracy Stener (authors of Making Music Fun series)- copy sets of cards onto different colored cardstock. (that’s why I used black and white drawings) . Then the kids are less likely to mix up the sets. I’ve made the cards so they are quick and easy to cut out – make a set of cards for your class in minutes. 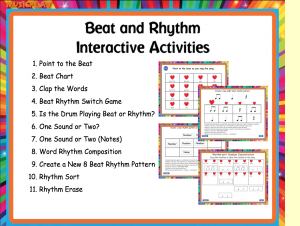 I’ll post the word rhythm cards at musicplayonline.com in the printables for Gr. 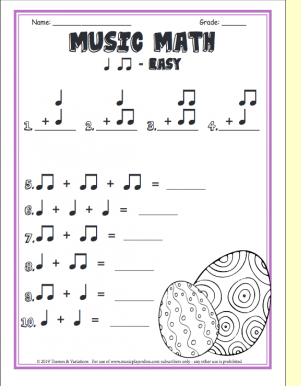 2 #75 Find the Easter Basket song tomorrow when I have my technicians to help me. 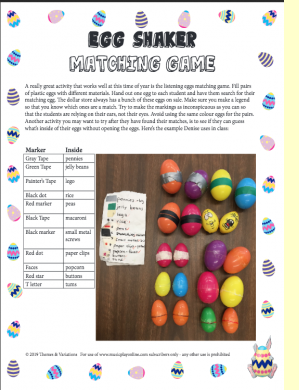 This entry was posted in Lesson Plans, Orff Arrangements, Spring, Uncategorized and tagged Easter composition activity, Easter music class ideas, Easter music lesson, music lesson plan, music lesson plans on March 25, 2018 by Denise Gagne.